The Well Played! 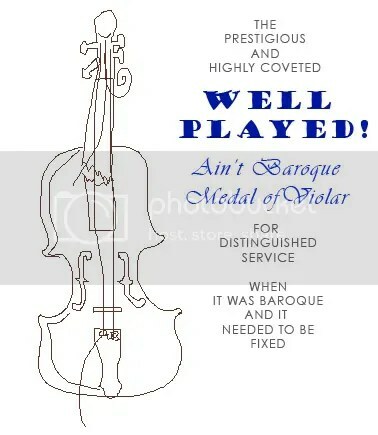 Ain’t Baroque Medal of Violar is awarded to those who go above and beyond the call of duty by contributing excellent and/or frequent content and commentary and just generally keep Ain’t Baroque relevant, running, and fun for the author. Recipients tend to be those who are regular readers who offer much in the way of comments and suggest material, but this is my blog so I can give it to whomever I want if I feel like it. So there! Honorees have the right to rip the above image and stick it on their web sites or whatever if they so choose. If any of the below information is incorrect, email me. Pat Klink, for sending me a visual viola joke. Christine Petrolati, for suggesting that rather than a Medal of Valor it should be a Medal of Violar. Dr. Carney, for offering up excellent comments and commentary and generating discussion over the “Music Major” video. Rebekah Herbold, for multiple assists including the Spiderman jazz video. The Kickass Classical dude, for viola fail. Gir the cat, nominated by Daniel for singing along. Stephen P. Brown, AB-nominated for commenting awesomeness. Chris McGovern, AB-nominated for commenting awesomeness. Tom Sharpe, AB-nominated for providing his own humorous commentary. Wow, thanks for the honorable mention, Jenn! !